Gangling Tommy Cross banged out a decisive victory over veteran Lew Massey in 10 rounds last night at the Olympia. With the speed and stamina of youth in his favor, Cross, a fast punching boy from North Philadelphia, was much too much fighter for Massey, a downtowner who has spent many seasons in the shattering fires of fists. It was Cross' fight all the way, save in the third round, when Massey pitched gloves so busily that he took his only period of the bout. Through the first six rounds, it was a bitter combat between old rivals who had waged a draw last season. Yet Cross' jabs, his long right crosses and his digs at the body gave him an appreciable edge. Then, as Massey faded, the saffron sharpshooter began to get hot. Massey was forced to weather a rattling drumfire of head shots, most of them right-handers through the last four rounds. Cross, by no means a "killer", smacked the battle-scarred Italian with many a punch, but Massey took them all with a rare display of gallantry. 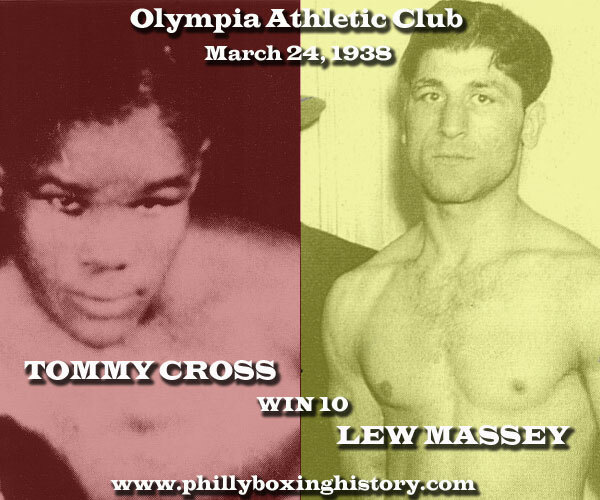 Cross, who recently moved into recognition as Philadelphia's leading lightweight when he defeated Eddie Cool, weighed 133 pounds; Massey went 136.